Domaine Guigal is the most famous producer of Cote Rotie in the Rhone valley. Guigal also produces great wines from a myriad of appellations in the Rhone valley including Hermitage. Guigal is also the second largest negociant in the Southern Rhone, selling close to 35,000 cases per year. Guigal Chateauneuf du Pape is a very good, consistent expression of Southern Rhone wine, matching nice style at a reasonable price. Guigal Chateauneuf du Pape drinks well young. Guigal owns more than 45 hectares of what people say are the best parcels of land in Cote Rotie and Hermitage. However, Guigal Chateauneuf du Pape is made entirely from purchased fruit. The grapes are grown to their specifications as is the finished wine they also buy to bottle. Guigal is the dominant negociant in the Rhone Valley, which is amazing when you consider that the company is not really that old. Eitenne Guigal got his start in the St. Etienne area when he took a job with Vidal Fleury. After 15 years at the firm, he left in 1946 and formed Ets, Guigal, short for Establissements Guigal. In 1984, Guigal purchased the firm that gave him his start, Vidal Fleury. Etienne Guigal passed way in 1988 at the age of 79. Marcel Guigal was managing the properties by that time. Philippe Guigal, the only son of Marcel Guigal was born in 1975. The company remains a family business. So far, Guigal only produces 1 red Chateauneuf du Pape wine under their name. They purchased de Nalys in 2017. Guigal Chateauneuf du Pape is made from a blend that is mostly Grenache with a small percentage of Mourvedre and perhaps a little bit of Syrah. The grapes used to produce Guigal Chateauneuf du Pape come from purchased fruit, and rented vines. The wine is then aged for up to two years in foudres before being bottled and released. The production is large. 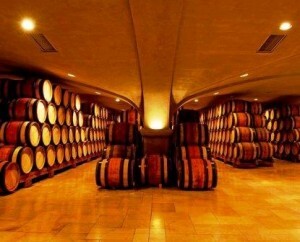 On average, it is close to 15,000 cases of red Guigal Chateauneuf du Pape that is made each vintage. Domaine Guigal Chateauneuf du Pape can be enjoyed on the young side. Young vintages can be popped and poured, or decanted for about 1 hour, give or take. This allows the wine to soften and open its perfume. Older vintages might need very little decanting, just enough to remove the sediment. Domaine Guigal Chateauneuf du Pape is usually better with 3-4 years of bottle age. Of course that can vary slightly, depending on the vintage. In the best vintages the wine should be consumed within 3-12 years after the vintage. Guigal Chateauneuf du Pape is best served at 15.5 degrees Celsius, 60 degrees Fahrenheit. The cool, almost cellar temperature gives the wine more freshness and lift. Guigal Chateauneuf du Pape is best served with all types of classic meat dishes, veal, pork, beef, lamb, duck, game, roast chicken, roasted, braised, stewed dishes, sausage, barbecue and cassoulet. Guigal Chateauneuf du Pape is also good with Asian dishes, hearty fish courses like tuna, mushrooms pasta, eggplant, cheese and tomatoes. The white wine of Guigal Chateauneuf du Pape is best served with a myriad of different seafood dishes, shellfish, crab, lobster, sushi, sashimi, chicken, pork and veal, as well as Asian cuisine. After the purchase of what is now Guigal Ex Voto in Hermitage, many people Guigal will eventually purchase a vineyard in Chateauneuf du Pape as well. My guess is, it is only a matter of time. But your guess is as good as mine as to if, or when.